Well it was bound to happen sooner than later, but for the life of me I didn't expect it to be so soon! Squirt landed her very first bad grade in classwork this week. The subject? Social Studies. A fun subject for a kid in Kindergarten as they learn how to say the Pledge of Allegiance and hear stories about Ben Franklin, George Washington and Betsy Ross sewing up our first American Flag. 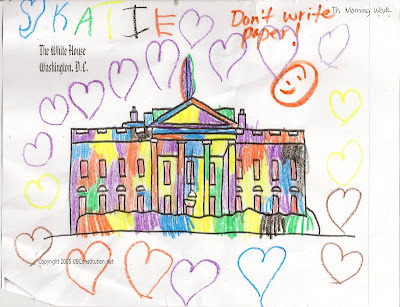 What did the teacher think was going to happen when she handed copies out to the class of a picture of The White House? Perhaps I shouldn't feel this way, but Squirt does me proud. She's a rebel, outside-of-the-box kind of kid with a confident mind of her own. And to think, they call John McCain a Maverick! Ha! Just wait until Squirt grows up and runs for President! I love the colors and maybe we can use her ideas. My daughter also ran into the same problem she liked multiple colors. So I am sorry if she got in trouble but I liked her picture. great colours and I know you'll encourage the free thinking, how else do we move forward and achieve? Where's the bad grade? I'd have given her an A+++++++++! That is actually great coloring for that age. Trust me I give dinosaur pictures to little kids all the time and they often cant do it like that. I wonder how much trouble Hillary Clinton would have gotten in if she repainted the White House as President. Something to match her catalog of pantsuits. Well, the White House is just begging to be painted! Good on Squirt! She's a visionary. Fussy teacher. I liked the picture. And I liked those little hearts. Somebody has to love Washington. Squirt is really talented,pls dont care about her grades. How is a child supposed to understand "don't write" when the teacher herself drew a little happy face? I think the picture is wonderful! Your daughter is talented, intelligent girl, and it is the most important. My best wishes to her and to her parents. Smart people always push the limits. I say great! I don't get it; what did she do so wrong? ?